Hey Vanessa,Im your biggest fan from New York City. Smooches and hugs and wishes for a very happy new year! That picture is awesome! I'd love to see NYC during Chistmastime. Happy New Year! WOW, this photo is amazing! The light is exquisite. Thank you for sharing! great picture!! fun! I am your new follower from the hop..pls follow back if you can! And Happy New Year! Hope the new year brings you all good things, Vanessa. Happy New Year! That's a beautiful picture! Thanks for linking up with us today! Wow, I didnt know that was right in my backyard. New York right? Next year I will have to go there to see it all! Hi! I am a new follower from the Tiggerific Tuesday blog hop. Since you enjoy blog hops, you should check out the blog hops at my site: Link Rink. Great photo. I found you on the whimsical blog hop. I will have to look into reading your books. I loved that someone compared you to a female Stephen King because he is one of my favorite authors. I am a new follower. Where is the beautiful decoration? Love it. New follower! I love this New York Picture... its now my screen saver! Love the picture! NYC always looks amazing during the holidays. 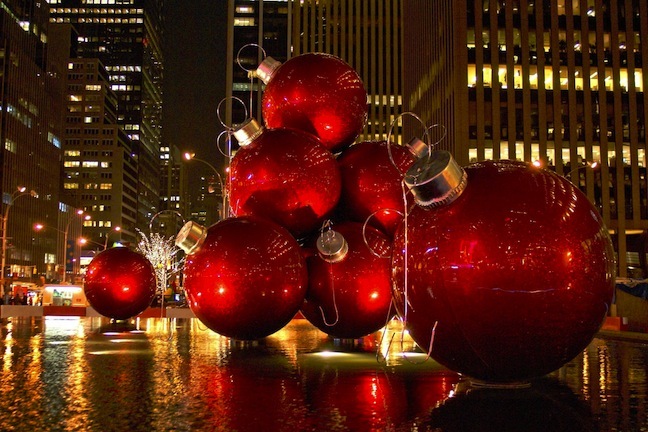 Truly, New York is a city with big balls. Happy New Year! Happy New Year to you, too, Vanessa. Never too late for good wishes. Christmas in NYC! There's nothing else like it! Beautiful picture! Happy New Year :) I'm a new follower, glad to have found you. Love the picture...happy new years to all! Wow that is pretty!! Happy New Year and I am a new follower.